People donate items to be auctioned off for a community member. Neighbours surprise a 91-year-old poppy seller who spends her life helping others in Berkshire. Browse content similar to Thatcham. Check below for episodes and series from the same categories and more! yet we can feel miles apart from one another. But not today. all here to raise money for one incredibly special person. she hasn't got a clue all of this is for her. and help the townsfolk she loves with all her heart. -She's like the queen of Thatcham. -Hail, Joyce, we love you. so we're going to have a street auction on her behalf. But will Joyce's neighbours return the favour and donate enough? That's absolutely beautiful. Onyx. I love the dials on it. -And this one's Thatcham, isn't it? -They're never out of fashion. You've been really generous, all of you. Ah. No-one in. Let's try next door. -Hopefully, he won't munch on ME! Let me just shut the gate. Hang on. when she discovers this is all for her? This is all for you, my darling. Today, we're in the Berkshire town of Thatcham. and now has a population of 25,000.
and that's 91-year-old Joyce Lovelock. As her saying is, "Never fear, Joyce is here." I just think she's a credit to us all. Joyce is a woman who never tires of giving. I feel I'm helping somebody. So, when did Mum first move here? "because Thatcham's my life, Thatcham's my heart,"
and that's where she wanted to stay. including sisters Audrey and Shirley. there was no material things, but Mum made do and mend. 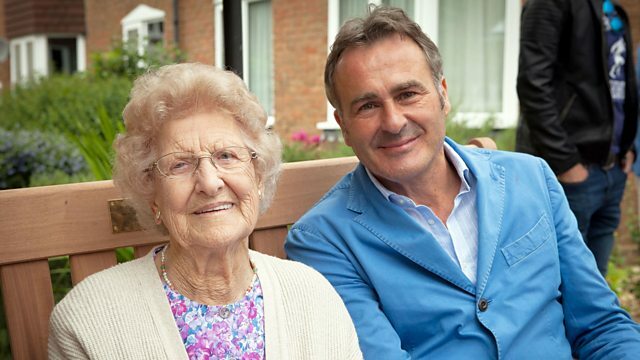 When it came to helping others, Joyce's mum, Elsie, led by example. She always helped people. She did. She was always washing and ironing for somebody. but their 30 happy years together ended when he passed away. He had rheumatoid arthritis, he was unrecognisable. that was always full of laughter and fun. ..not a day goes by when we don't think of him. Couldn't wish for a better husband. Joyce threw herself into charity work and helping others. They always used to say, "Look after those that can't help themselves." I always think of these words, yes, I do. I'm just so proud of her. or knows what she's done to help and she's just an amazing lady. -So, she's up really early? -She's up at five in the morning. -does their shopping as well. Then she picks up the shopping lists, does all their shopping. How long has she been doing the poppy appeal for, selling poppies? -She's got a great heart and soul. The cost will be £1,000, and this is how we're going to do it. which is happening in about a month's time. Now, that is a big ask. that is going to be a challenge and a half. -You don't now what you let yourself in for. -Come on, let's walk and talk, OK. I want to help her and I need your help. -so we need to put her first. -second-hand kids' clothes, bikes, toys, you name it. cos hopefully, you can upcycle a few things. and, hopefully, we can make a few quid. -Make some bucks - that's what it's all about. I'm going over there, so let's start around there. -I'll keep an eye on you. No-one in. Right, let's try next door..
No luck. At least the houses are close together. No, no joy. OK, let's try another one. DOG BARKS Yeah, I see you! Sounds like a little dog in this house. Listen to this. Dogs all over the place. They're having a conversation with each other. "Don't let them in." Oh, hello. Oh, let me just shut the gate. Hang on. Is he friendly? -Is it a boy or girl? It's a boy and goes by the name of Raffa. The owner, Norman, might have something for us in his garage. Oh, I'm loving this! This is a proper adventure. -Carpentry and joining is what I used to do years ago. but they could be handy for someone and might fetch a couple of pounds. -Would you be willing to donate these? and, in good second-hand condition, could make £20 each. -Who did these belong to before? -My daughter and her husband. -They live in the Caribbean. It's obviously too hot to cycle in the Caribbean. -What's your name, by the way? It weighs an absolute ton. You're welcome to take that. 'partly because they need a lot of polishing. Brilliant! Thank you. Thank you. Sorry to barge in on you. Now off her bike, Irina's met 84-year-old Douglas. send off to the junk shop or something. so we might have a bit of luck here. and used in jewellery and ornament making for centuries. That's OK cos some clockmakers could get this to work again. -And you bought this in Paris? -How old do you think this is? for someone who collects and fixes clocks. It's such a generous gift for you to donate. Thank you very much. And that's going to be now on someone's mantelpiece on display. -That's right, that's what it's for. and doesn't even know Joyce. We've got to start here - a good old cut and blow-dry. 'I bet they know about Joyce in here.' You know her, yeah? -She used to babysit me when I was little. OK, does she go shopping for all the other old folk? -Yeah, she comes up here. -Brilliant, you all know her. -Yeah, we all know her. -a free cut and blow-dry that I can auction off. -You said Joyce used to babysit you. -Me and my sister, yeah. Tell me about her then. after school and before that. We used to stay overnight when she lived in Chapel Street. Should be tears all round on the day. -You've been a big help, thank you. and I just saw Joyce walk past. There, look. She's just gone down to the baker's shop. Do you know what? cos they obviously know her and, hopefully, we can get some buns. 'so let's go and see if they can bake up a storm for us. She is the most sweetest, caring, kind individual. -She would do anything for anybody. and she's always coming in. -she gets all their medicine, gets all their stuff for them. -She's the star of Thatcham. Could you make some cakes for us to sell or something like that? -Whatever you've got, it would great. There will be a lot of people turning up and they'll be hungry. -Back on the street, Irina's spirits are getting even higher. -Do you know where these are from? You could put some nice whisky in there. but John has one good idea for starting a revival. Do you want me to fill it up? and it's all for Joyce's benefit. -Yeah, I do know her. She's always been a very caring lady. She's had a lot to do with the British Legion, selling poppies. Always caring for the elderly. because of her father, Edward's, service in the First World War. He didn't want to leave us, course he didn't. But he had a duty to do, so he was willing to do it. and fought in the Battle of the Somme. After the war, he returned home to be with his family. He was very, very lucky to come back, especially with the trenches. He was in the trenches. because he relived his time in the trenches. He suffered with his lungs because he was gassed. in memory of her father and would often take her daughters with her. getting money to put in the poppy tin. -Do many people use that? -It's too tempting. I love it. Thanks a lot. Well, I love your bell. -Um, did you get a leaflet through the door? -So you know what this is about. -Yeah, I've got a few bits for you. And inside, Rosemary is true to her word. -Love it, yes. That's fantastic. -People go crazy for these. we had these, made of ceramic. to keep the passengers warm. -What did you use to use it for? -Yeah. It used to sit on there. It used to be a doorstop. I reckon we could get a fiver for it on the bric-a-brac stall. But Rosemary has raided her jewellery box too. So, these are like semiprecious stones. They're so pretty. I love the green colour. -so they probably were hand-made, actually. They are beautiful and silver is very contemporary. But there's more. -These need a clean, actually. -Are they silver as well? -I can't get them on any more. Yeah, I know, I've got tiny wrists. Don't get too attached, Irina. Those bangles are saleroom bound. -You been with Granny today then? -Ah, that's sweet, isn't it? You know where you live? Oh, bless! Oh, isn't that sweet? Have you got anything you can donate towards our street party? -Yeah, I've got stuff in the garage. -Can we come and have a look? Thank you. Thank you. Bless you. Are we going to be allowed to take things away if they were yours? This is going to be really hard to take away. I've got a daughter and anything pink doesn't leave the house. -Will we be able to sell this? -Can we sell this so other little girls can play with it? -You're such a good sharer, aren't you? Ah! We'll put one there. There we go. What's this? Do you know what this is? 'for a good second-hand kiddy's toy.' Ah. It does need a bit of attention. an old timepiece could strike the right note for the saleroom. -Are you giving this away? Beautiful, classic watch there. Lady's watch. but I think that could tick-tock to £50 in the saleroom. Yeah, lots of the stones are missing from those. That's OK, you can't tell. -Somebody might be able to put the stones back or whatever. especially with the fringe below. I think somebody's going to really love these and cherish them. will probably split them into groups to get the very best price. I' going to give you a hug. Thank you so much, thank you. What a wonderful donation. And we're still getting more at Millie's. -Yes, please. Can we have that? We could paint that a bright colour. Oh! That's brilliant. Are you sure? -Right, do you know what? I'm going to get this out before you change your mind. it would cost you £120, £150. We can paint that and I reckon we'll get £30 for that. It's brilliant. You've been really generous, all of you. -A Denby pottery? Denby's such a great make! You know what's so good about these? you can pop into a shop and buy it. It looks brand-new. -Does Mummy not use it, no? Hmm, wow! Very nice, thank you. and loves the place and the people. That's the church where she married Harold. Oh, really nice. I know they're only... That one's a modern print. -This one's Thatcham, isn't it? -Yeah, that's St Mary's Church in Thatcham. That's a print as well, but it's a limited edition. 41 of 100.
don't you? Isn't that sweet? Oh, thank you very much! it looks like a sort of 1980s print, mass-produced. We might get a couple of quid for that. And this one's another print. It's a limited edition of 41 out of 100. We might get £10 for that, which is great. It's all going to help. I wonder if Irina will uncover anything else with a local link? Hello, sir. Oh, a meerkat. Oh, my God, that's amazing! -I'm not so sure, Irina. -Well, I've got some more in there. He just whips this out from behind the door. It's a meerkat. I'm in love with him already. Right now, meerkat stone statues are very popular garden ornaments. but its cuteness factor should garner £5 on our stalls. where Joyce is one of Sue's regular customers. Whether it's cold, rainy, hot, she's here, all weathers. She also comes into the shop to do everybody's shopping. -She's one in a million. -"Never fear, Joyce is here." as sisters Shirley and Audrey know only too well. Early morning papers for at least, I think, nine or ten people, isn't it? And that would be round about 7 o'clock, isn't it? Yeah, 7 o'clock, half past. What sort of a night did you have? Dougie had a good night? Cos he's going today, isn't he? Or is it tomorrow? I shall do your shopping and get your things. I can't say enough about her help. But she's...the light of my life. She's my rock. I just love her to death. And I hope she goes on for a few more years yet. 'we've attracted the attention of Joyce and her neighbours. asking if they have any unloved or unwanted items. cos she read the paper and she brought God knows what. I've got it in my bedroom. So tell me a bit about yourself, Joyce. What do you do? Wow, you don't look it! Well, that's what they tell me. I'm glad you've told me that. help others that can't help themselves. And if there's anybody wants anything, they've only got to ask. I can see loads of eggs in there. What's going on? -That's shopping for other people. -I go shopping for other people. You go shopping for other people? People should go shopping for YOU! -She shops for other people. -No, I love doing it, don't I? -You've got to start slowing down! -Why? Don't start telling me that! -Do you think that's what keeps you going then? -Lovely little home you've got, Joyce. -Oh, wow, look at this. -It's a collection of thimbles. -There's a pair of shoes in there. -Quite a few people have twigged. -A couple of her friends have twigged. -I didn't tell them, but the word's leaking out now. I sure hope not because we won't get her here if she knows about it. -Oh, no, not ME again! -Is that for us as well? Joyce, have you been having another clearout? No, that's our lovely mirror. That's a lovely mirror because it's got a nice bevel on it. that would be about £50 with a bevel, so that's a tenner for us. -And that's nice as well, isn't it? -Joyce, thank you very much. I wanted to get more from her about Joyce, you know. She was saying she's so proud of her. I would be, if that was my mum. Gosh, I would be. Brought us a choice of mirrors and these. to see what Irina and I have collected on our rummage. that we can send over to the saleroom to make more money? -I like those saw horses. -Little stools to sit on in the kitchen. Did you find anything to go off to auction, cos I found nothing? I did, actually. Some of these, some of this gorgeous silver jewellery. -Look at the carving - texture and detail. -We'll send that to auction. -Great, we'll send that off. 'On closer inspection, that's a very elegant lady's watch. 'We might get more than the £50 I first thought. 'with its French brass movement. -This. That's what I was pointing to. -That's brand-new but they're a lot of money to buy. -Surely there's £10 to £15 there. -It's gorgeous royal blue, popular make. -Yeah, I like it. Let's have a look. -Can you do something with that? -I think so. What colour? -It's up to you, it's up to you. -I'd put a hanging rail in there. Maybe a shelf at the bottom for shoes. -like bright pink or something? Well, looking at those lines, I think it's a draw, don't you? -Yeah? High five, come on. -Well done, you, well done. -I think we're sort of £200 to £300? But our job isn't done right now. and it's about community spirit. Will they deliver? We're going to find out. Well, our D-day has arrived and, boy, do we have a lot to do?! There's the van to empty, stalls to fill. -But there's more than bunting to hang. Do you think we could go and buy some hangers? -to see if anybody's got any spare hangers. Remember, this is all for Joyce. Have you got any spare coat hangers, please? Now, what's that saying? "Ask and they will come." Look at these gorgeous hangers. This could be our little showstopper. I absolutely loved meeting Joyce. She's such a special lady. I've got to keep my voice down because she is around. so Joyce and her sisters are working on the raffle all day long. so let's meet our stewards. Morning, everyone! Everybody's going to be thirsty and hungry. -You're going to be worked off your feet today. But you'll make a lot of money. Mark everything up - £1 up to £5. and I'm going to check on you, OK? Oh, you're not going to do a singsong, are you, Audrey, John? -When we get Joyce with us. -And my sister in the wheelchair. -She'll remember the words. We're going to do our sister song. Go on, give us a little tiny example, a little rendition. 'I think they'll work better as a trio. 'The bric-a-brac stall is filling up nicely. That's quite nice. Look at that. There's a bit of studio pottery there. It's from Newlyn in Cornwall. I like that. That's 20th-century modern. I guess that's 1980s, 1990s. I'm going to sell that one on the rostrum. Might get £10 for that. He's nice - or she. "My name is Primrose." She's lovely! it's got the look. It's beautifully weighted and it's articulated. 'can sell for tens of thousands of pounds. along with this bit of studio pottery. 'It's a clay model gorilla. because I think he just might get overlooked here. Hopefully, on the rostrum, all being well, £10 plus. I think we could triple our money. I'm going to sell this one on the pop-up auction. is the child's wardrobe Irina has upcycled. Remember how it used to look. and then sealed with varnish. And now, here is our upcycling. I'm ever so excited to be looking at this. -You have done a fantastic job, my darling. -someone funky, someone that remembers the past. we'd better get this show on the road. 'The good people of Thatcham haven't let us down. No, we need a bubble machine. My feet might be dancing, but so are my nerves. There's no sign of Joyce yet. I hope she hasn't twigged and done a runner. Right now, Irina's helping Joyce's sisters drum up business. Come and buy your raffle tickets! A strip? Steady on, Irina! 'but I still haven't spotted Joyce yet. The auctioneer is Marc Burridge. to see how they fared under the hammer. which I can see making over £100. And I have interest on the book. £90 here. And 5 in the room. 100. Take 10, sir? 110 in the room. And 20, will you? -All done at £110 then. Well, that struck it rich in the saleroom. and her collection of silver jewellery will do the same. The estimate is between £30 and £40, but I think they could do better. 30 I have. And 5. 35. 5, thank you. 50. And 60. And 70. And 80. And 90. At £90 then. -We're selling on £90. Well done. That was brilliant! But we've had some exciting news. as rubies, diamonds and emeralds. and she's still happy to donate them. I think we could get over £150. On the book here at £100 to start. Thank you, 110. 130. 140. 150. 150. 160. -And I'm selling on £180 then. Wow, those earrings definitely sparkled in the saleroom. Those items we sent off to auction did exceptionally well. ready to present it to her later on, at the very end, after the auction. to give Joyce and perhaps some of her family a great day out. But right now, the party girl herself has finally arrived. -I remember talking to you, don't I? -I know it, I'm just kidding you! -Hey, you gave us lots of things, didn't you? Well, up and down like a yo-yo, but I still keep going. -I still keep going, see? we can get a chorus from the Golden Girls. -Absolutely brilliant! You should all be on stage. We're not the Beverleys but we're the next best. You're all fabulous, you're absolutely brilliant. but how do OUR figures tally? The countdown from today's sales on the bric-a-brac stall. Well, for the day's sale, Paul, we've made £556.50. -Plus £380 from the auction. By my reckoning, I've got to make about £80, £70 to £80. -You can do that hands down. -I've got to do £100. I'm going to get on the rostrum now. 'but can we get over our target? 'First up, it's that adorable teddy bear I spotted earlier. Lot number 1. Who's going to buy this teddy bear for £5? Yes, lots of yeses, thank you. 5, I'm in at 5. £8, thank you. The bid's now against you. I'll take 10. £10. £12. Thank you, £15. It's against you now. 16, thank you. 17. You're out. £17. And I'm selling at £17. APPLAUSE 'That's a good start. 'It would have never have made that on the bric-a-brac stall. Thank you. £3. I'm looking for 5 anywhere. No? I've got a bid of 3 and I'm taking 3. It's going once. 5. 10, thank you. £10. £10. 12 anywhere? I'll take 12. 12. It's against you now. Oh, two hands. I'll take 12 and 13, yeah? I have a bid of £25 and I'm selling. GAVEL BANGS Sold. Thank you. £25. 'I never saw it reaching that price. Are we back on track, I wonder? 'Up next is the upcycled children's wardrobe. £25, thank you, sir. Straight in. One bid at 25. £30, thank you. It's against you, sir. £35, thank you, sir. I've got a bid of £35 with me and I'm selling at £35. 'have reaped a financial reward. Chap standing underneath the tree, and I'm selling at £25. Fair warning, it's going once, twice... Sold. 'But what about the limited edition Thatcham print? Our last lot of the day. £10, surely. Thank you. Straight in at 10. 15. 20. £35. Can I make that 40? 40? That bid might just get it. 40. £40. 41 if it helps. 41? Thank you for your bid, sir. £40. And I'm selling at £40. who lives here in your community. We have done our target and we've beaten it! It's all about the community, bringing people together. and I've come to understand what this person does. She works tirelessly and selflessly for other people day in and day out. and I can't believe we've managed to keep this a secret for so long. But, I tell you what, I don't think she's twigged it yet. I can let you into who this is for. -This is all for you. Thank you so much for helping everybody day in and day out. -Oh, I love them all, I love them all. -Oh, I know you do. -It's all your family, isn't it? A big round of applause for this bench. Look at that! -Thank you so, so much, everybody. We've arranged for you a special trip. at the British Legion National Memorial Arboretum. Thank you all, everybody, for all you've done for me. I much appreciate it but I've got a job to accept it. It is all about you, Joyce. You are my hero, you really are. Wonderful! We've got one over there but it can go now! -What will you all do if anything happens to me? -You'll have to take it. and think of this day, won't we? As you can see, the whole community made this possible. and I tell you what - that lady is a superstar. She's 91 years old and she's a great example to all of us. Never give up, keep on helping people. And that's really what this show is all about. I hope you've enjoyed it. at the National Memorial Arboretum, proudly wearing her father's medals. She paid her respects to those who'd given their lives in service. People donate items to be auctioned off for a community member. Neighbours surprise a 91-year-old poppy seller who spends her life helping others in Berkshire. Presenters Paul Martin and Irina Aggrey collect donated items to sell at a street auction on her doorstep.